Here in West Michigan, U-pick blueberries are pretty easy to come by — and in just a couple more weeks, they will be ready to pick (the picture below is of the 20 pounds of blueberries we got last summer)! Growing up, I never liked blueberries but, over the years, I’ve grown to love them — especially when they are baked into yummy desserts. Nora’s favorite way to eat blueberries is frozen (she calls them ‘blueberry ice cubes’) but Dave definitely shares my love of blueberry desserts. 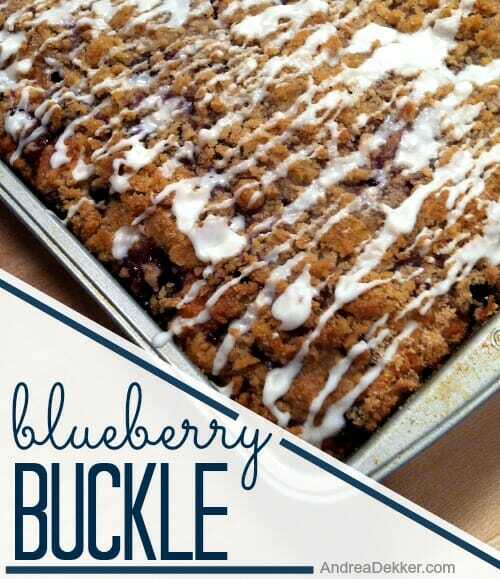 The blueberry buckle recipe I’m sharing today is one of our favorites — and it’s SOOOOO easy. Much easier than a pie, and even simpler than muffins because you can just dump everything into one pan and bake. The original recipe is one I tweaked from the Better Home’s and Garden New Baking Book (one of my favorite cookbooks) — so you know it has to be pretty good! There’s almost no way you can ruin this recipe unless you bake it for way too long; and as long as you set the timer, you shouldn’t have to worry about that. In a medium bowl, mix butter, egg, and sugar with an electric mixer. Add in milk, flour, baking powder, and salt. Mix until just combined. The batter will be quite thick — feel free to add a couple extra Tablespoons of milk if it’s too thick. Spoon cake mixture in greased pan. Sprinkle blueberries to completely cover the cake mixture. Lightly press them down. 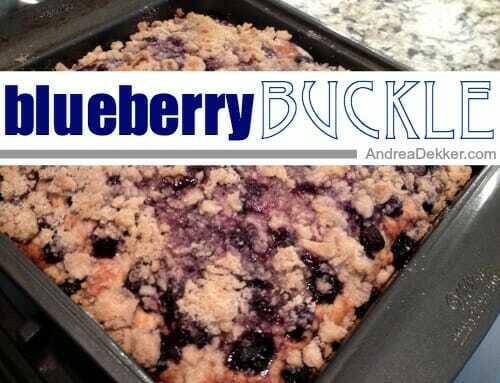 This blueberry buckle is so delicious warm out of the oven (or reheated as leftovers). 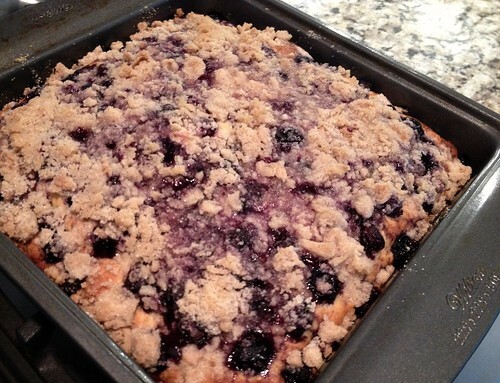 When I told Nora I was making “blueberry buckle” I figured she would be really excited since she loves blueberries. 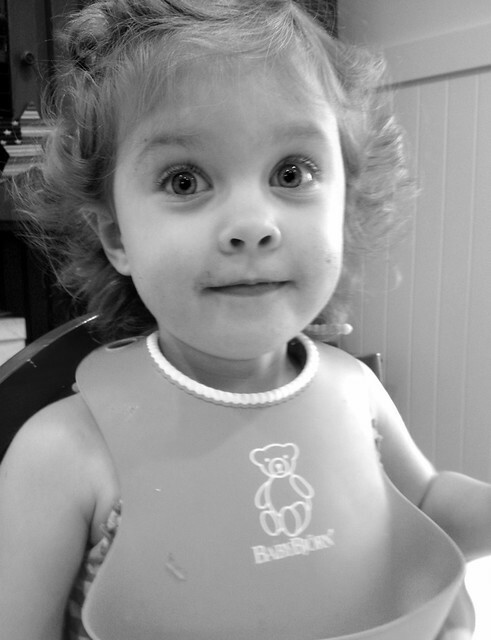 However, she started crying saying she didn’t want to eat “buckles”. I think one of the main reasons I love this recipe so much is because I like cake — just not the frosting. 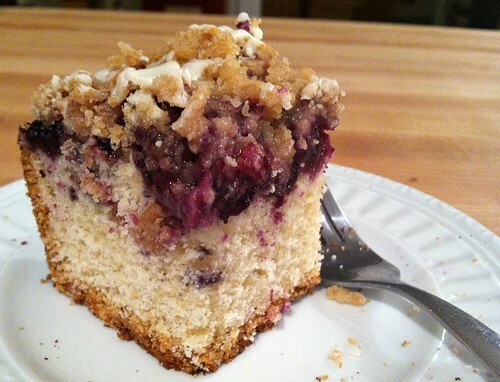 So this is basically like a dense cake with blueberries and streusel topping instead of super sweet sugary frosting. The optional vanilla glaze (which is just powdered sugar and milk) is the prefect amount of “frosting” for me. As blueberry season approaches here in Michigan, you can bet I’ll be making this recipe a couple more times — and of course, putting LOTS of blueberries in the freezer for later in the year! Baking emergency!! When I made the batter, I accidentally used 1 cup of softened butter (instead of 1/2 cup), but didn’t realize it until it was already in the oven… now I wonder if it will totally flop, or if I should cook it for shorter or longer to have any chance of it turning out edible..
Well, it turned out okay. I did cook it longer for the center to set up, and the flavor is awful buttery and dense…but it is not too bad! We already ate half of it, and the next time I will not bake with my 1 year old “helping” me. I know the last time I made it, it was really delicious! Thanks for the great recipe! glad it turned out sort of OK! I received the doubled recipe, a 9×13 pan. It’s always a winner ! I am in my 9th month of pregnancy and I have limited my cooking to filling meals that I would make like three times a week so we eat leftovers throughout the week. I saw your recipe online and it looked easy enough plus I had all of the ingredients including a ton of blueberries. I went into the kitchen and got to work. The batter needed at least half a cup more of milk and I was still sure it wouldn’t come out but I made it as stated, Leaving out the glaze since that was one extra step I didn’t need. I got it out of the oven and the smell was amazing and it tasted incredible. The blueberries made it incredibly moist! yay — glad you liked it! Sometimes I haven’t had to add any extra milk and other times I need to add more. It’s so weird — I wonder if it’s just how I measure the flour or something like that? 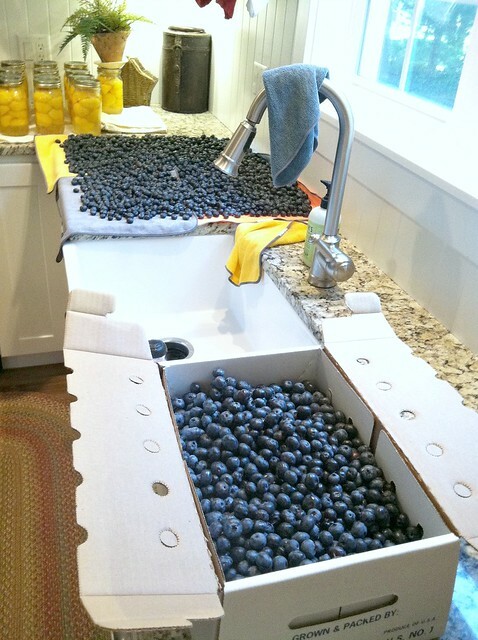 Oh Andrea – I am SO jealous that you guys can get blueberries in such abundance. My daughter ADORES them (as do I) but they are SO expensive here in Australia and we don’t have a PYO option. 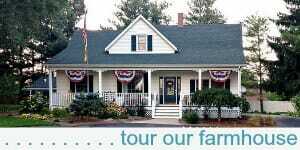 An average price for a 150g punnet of blueberries is AUD $6.99. One time I actually counted out the blueberries in a punnet and they worked out at 9 cents EACH ! I usually wait until frozen blueberries come on sale and stock up then. Your recipe sounds delicious ! I have this EXACT recipe and have made it for years. Of course, everyone fights to have the only “crustless” piece from the center of the 9×9 pan. My solution: bake it in a springform pan. That way everyone gets a bit of the super-soft center of the buckle! 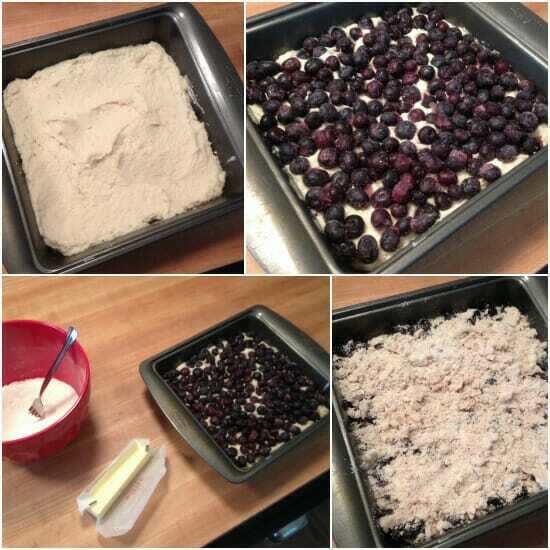 The BEST blueberry recipe! My mom and grandmother have made this for years and I grew up thinking it was a “family” recipe even though no one ever told me that. I made it well into my 40’s before I found out it was from a cookbook!!! I guess that’s a good thing since it means many more people are enjoying this absolutely delicious treat. It’s wonderful hot out of the oven or leftover – if you’re lucky enough to have leftovers…. 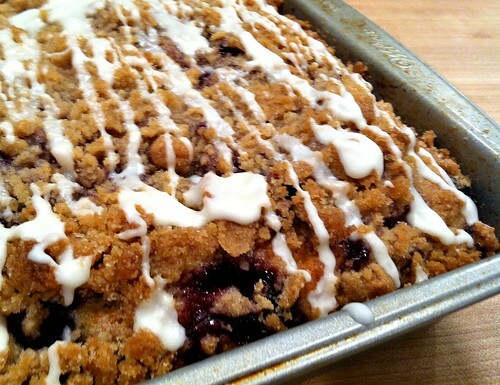 This is a really good blueberry recipe, isn’t it?? Glad you’ve been enjoying it for years already! So, question for you: I noticed you dry your washed blueberries on washcloths. Do they get stained? I picked strawberries this weekend and was bemoaning the fact that I had to use so many paper towels to dry them. This gets pricy! 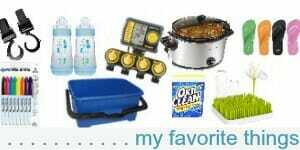 But I don’t want to stain all my good kitchen towels. How’s this worked for you? 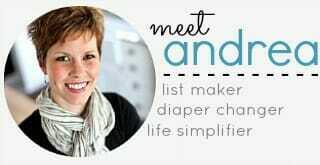 I have a couple of old bath towels that I keep around for exactly this purpose! Hi Kylie, I used a few older kitchen towels for the blueberries — and all the staining came out when I bleached them. You’d never even know that I dried blueberries with them! This past weekend, my 4 year old son and I made some of your yogurt smoothies, but instead of drinking them, we put them in popsicle molds and made smoothie popsicles! Delicious!!! We made them with blueberries, bananas and strawberries. YUM!! That is such a good idea! Dave and I said we should look for popsicle molds to start making popsicles for Nora. She loves smoothies and popsicles so I’m sure these would be a hit too!